Magic proves dangerous, but not as dangerous as other people. I should preface this review by stating that I may be coming to this review with some bias. Victor LaValle is one of my absolute favorite authors: his work is constantly exciting, exquisitely written, and expectation defying. I also have long been fascinated by the work of H.P. Lovecraft, finding him equal parts compelling in his creation of truly unfathomable cosmic horror, uncomfortable, and infuriating. 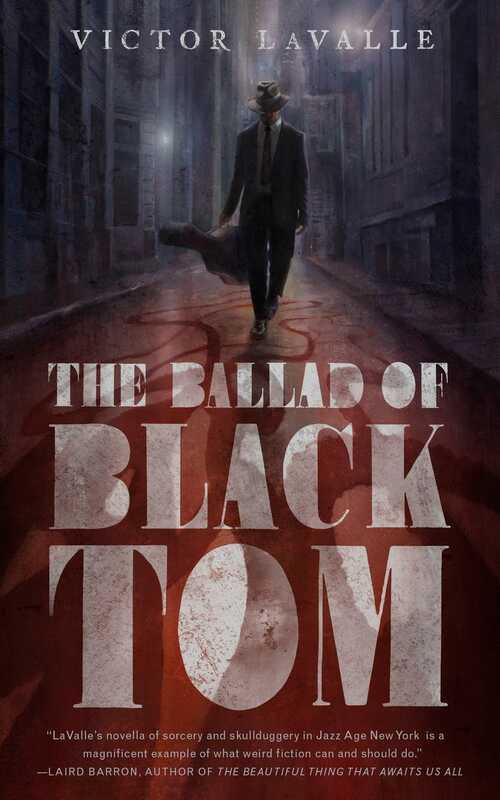 Thus, when I heard about LaValle’s reimagining of Lovecraft’s world, in the novella The Ballad of Black Tom, I was hooked before the book even was published. LaValle’s book centers on the character of Black Tom (I know, shocking, what with the title and all). The novella gives us Tom’s, really Charles Thomas Tester’s, backstory. He’s a good son and, arguably, a good person when the novella begins—even if his money-making means are a bit, well…Ominous. The speculative elements of the story are woven in seamlessly, at first feeling like an organic part of the fabric of the world and then slowly opening up in a more and more horrific manner. Tom is a character who we not only feel deep sympathy for, but whose story (to try not to give anything way) hinges on the injustice and brutality of the system built around him. LaValle has taken a character of nightmares and made him into a deeply human and tragic figure. LaValle’s writing is compelling, compulsively readable (I read the book in one sitting and then reread it, again in one sitting, a few days later), and beautifully constructed. One of the most brilliant qualities of the writing here is the evocation of place, so smoothly and beautifully done throughout the book: “Harlem. Only away for a night, but he’d missed the company. The bodies close to his on the street, boys running through traffic before the streetlights turned, on their way to school and daring each other to be bold.” The streets of Harlem, Flushing, and Red Hook come thoroughly alive in LaValle’s hands. If the book has a flaw, it’s its brevity. This feels like a wonderful short story and less like a novella. Maybe, I’m just greedy, but I wanted to be in this world, to see its horror and beauty spun out in more and more pages.